It's time for Lulu-Sophia to start learning to ride a bike. She turns two next month and already loves riding about in the yard on a variety of vehicles. Here's Lulu warming up for learning to ride a bicycle. It would seem that many Danish kids have a little plastic motorbike, like the ones in the video. I see them everywhere and they are, in a way, a forerunner to the balance bike. The back wheels are narrow and it requires some balance when learning to master it. When Felix, now seven, was learning to ride a bike four years ago, we started out with the classic Danish solution. Sticking a broom handle between the back forks and pushing him along. Just like Danish parents have done for many decades. Now you can buy [surprise surprise] attachable rods with a handle to do the same thing. In the photo at the top, a floor hockey stick is sufficient for pushing her along. It's amazing how quickly kids learn to steer. Felix moved quickly on to training wheels and I rode to daycare with him from the age of three and half on the bike lanes and side streets. Just after he turned four I saw that he wasn't using the training wheels anyone, but balancing on the two wheels so we started a quick transition to riding a bike on two wheels. Even just four or five years ago here in Denmark, balance bikes were a rare sight. Balance bikes being the small bikes with no pedals. 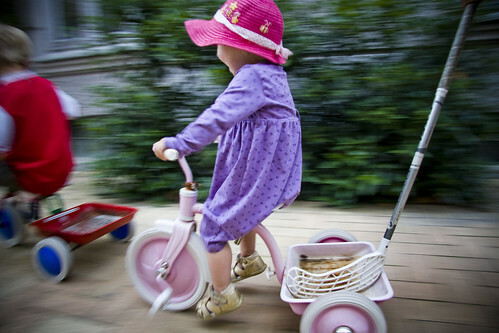 Called 'løbecykel' in Danish, [loopfiets in Dutch and laufrad in German] which means 'running bike', the name evolved from the word for childrens' scooters - 'løbehjul', or 'running wheel'. They are now a main prop when learning how to ride and I'll bet that training wheels are a thing of the past within ten years. So. Time to find a balance bike for Lulu. I quickly discovered that the market is completely saturated with brands. There's the Micro G-bike, the Puky, Mocka, assorted wooden brands, Hudora, Kokua's Likeabike, Strider bike, Mamamemo and then there's a host of cheap supermarket versions. On the one hand I find the selection impressive but on the other hand, it's irritating. A brand like Kokua is marketed as the Rolls Royce of balance bikes and costs 1000 kroner [$190] MORE than the cheapest make I've found. There are other brands that are in this price region, too. Now I like design. You can't really live in Denmark without liking design, it's an important part of life given our long design tradition for simplicity, functionality and aesthetics. But I draw the line at paying $1300 kroner [$250] for a little bicycle that will only be used for a year or two. So we're going for a cheap and cheerful brand that costs about 350-400 kroner [$65-75]. 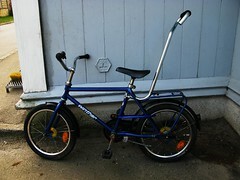 We quite fancy the Mamamemo as it has a little basket bag at the front and you can pull a trailer. Then I realised that there are sizes. 80 cm - about 2 years old and 90 cm - about 2.5 years old and Lulu is just a bit over 80 cm. We'll find one for her. And it'll probably be across the bridge in Sweden since their krone has suffered dreadfully since the global financial crisis and is at the lowest rate against the Danish krone in history. So you get to knock off a further 30-35% off the price. Anybody out there have any experience to share with balance bikes? Regarding brands and quality? Do tell. Do tell.